We are in a new era of foreigners and terrorists who are attacking our national security. To protect our country, we need to deprive those who attack Norway's security citizenship and change their passports. Today, citizenship can only be changed in cases where people have received it on an incorrect basis. In the fight against a whole new terrorist threat, we need new settlements that allow us to deprive terrorists and those attacking Norway's national interests of citizenship and passports. The Labor Party and others have claimed that I have made the mistake of my post yesterday. It is not true. The Labor Party goes to the Storting to vote down the entire home in order to deprive some citizenship when they are, for example, foreigners. Those who work closest to fighting terror and attacks on national security, the Police Security Service (PST), support the proposals. The threat of losing citizenship is a powerful and dissuasive instrument. Loss of citizenship will limit the possibility of engaging in terrorist activity in Norway because it opens for expulsion and because it makes it difficult to travel for those concerned. By getting this home in place we protect Norwegian society against those who want to destroy it. The reason we have suggested that this should be determined by the ministry is because this is a security measure. In order to avoid a terrorist attack, loss of citizenship must be able to be implemented quickly. It is not a question of going away from the rule of law, as some have argued in the debate. The decision can of course be brought before the courts. Since 2012, Norway has granted residence permits to people who have come as asylum seekers, family reunited, thousands of quota refugees through UN High Commissioner and 1500 relocated asylum seekers from Greece and Italy. Together, there are almost 80,000 people talking! This is a dramatically high number, which means that more people have come to Norway and have been living since 2012 than there are residents in today's Drammen municipality, Norway's 5th largest city. The Government and the FrP suggest that Norway will receive 1120 quota refugees through the UN High Commissioner for Refugees next year. Which is closer to the level we received before the Labor Party initiated to receive 8,000 Syrian refugees. This was FrP against. In addition to quota refugees, there will be an unknown number of asylum seekers on their own, and not least thousands of family reunions. Family reunification can be very high for many years to come because it has come so many in recent years. 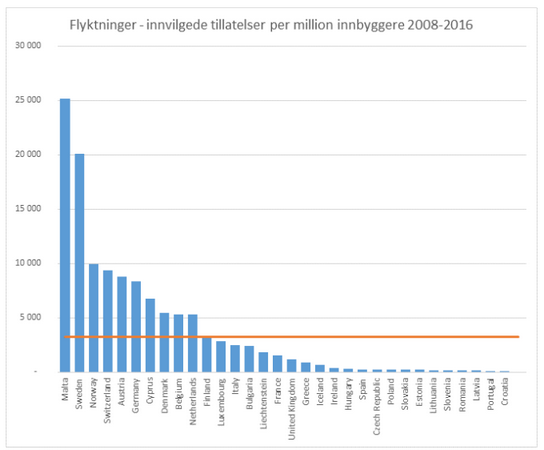 Looking at which countries in Europe have granted residence permits to most refugees per million inhabitants in the period 2008-2016, Norway is in third place after Malta and Sweden. We have huge challenges in integrating those who have already come. As mentioned above, there are almost 80,000 people only since 2012. Several community politicians I have talked with signal that worry about the increase in social assistance payments. Had employment been the same for non-Western immigrants as for the population by the way, we had 90,000 more employed. The integration results in the municipalities are very varied. Someone is doing well, while others make it catastrophically bad. 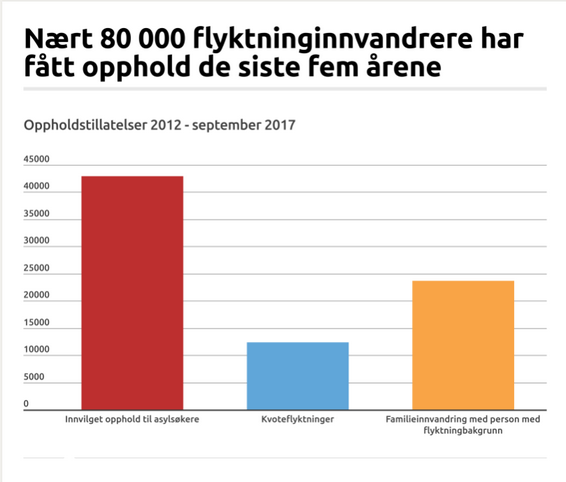 When the municipalities do not succeed in learning Norwegian and getting them at work, this is a problem for our society and the sustainability of our welfare model in the long term, but it is also a major problem for refugees that get a bad start to integration because the offer The municipality does not have quality objectives. Next year, the integration budget will almost double to finance the increase in the number settled after the major arrivals in 2015, to more than 17 billion. I believe that it does not delete money for integration, but the results are not good enough. In future, I will therefore work to look at how the money can be used better for better results. It is positive that asylum arrivals are now record low. 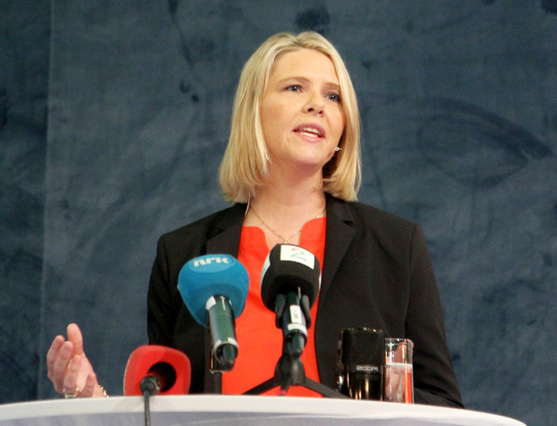 This gives us the opportunity to spend several billion kroner in neighborhoods for war and conflict, instead of funding asylum reception centers in Norway. 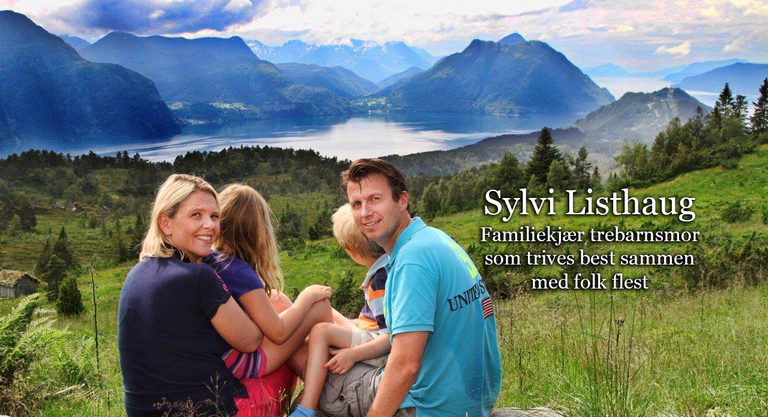 I find it difficult for those who lose their jobs around asylum reception in Norway. But I think it's good that this money is used to have children at school, to cover people's basic needs for food, health care and other in the immediate vicinity of war and conflict. The money stretches longer and we can help more of our 65 million fellow human beings in the world, escaping from war and conflict. Norwegian municipalities have done a great job of settling and, in particular, helping us cope with the critical situation that occurred in 2015 when more than 30,000 asylum seekers came to Norway. Now I mean that the main focus on noRussian municipalities must be integrating the nearly 80,000 people who have been granted permission to stay here only since 2012. We know that before this was granted permission to thousands of people every year. Should we take care of our welfare model in the longer term, and prevent even more pressure from our values in a longer perspective, our actions will be very important every year. We as politicians must take responsibility for accepting a sustainable number of people to be integrated. Then the brakes must be on. Russian municipalities must be integrating the nearly 80,000 people who have been granted permission to stay here only since 2012. We know that before this was granted permission to thousands of people every year. Should we take care of our welfare model in the longer term, and prevent even more pressure from our values in a longer perspective, our actions will be very important every year. We as politicians must take responsibility for accepting a sustainable number of people to be integrated. Then the brakes must go on.